Stacie L makes it a point to ride her cruiser bike as much as she can. Riding through nature is healthy and lifts one' spirits. The top women's leisure or cruising bikes are those that are comfortable to ride. They have come a long way since I was a girl. No more are the heavy metal clunkers with balloon tires and sharp edges. They are designed to be the easier to pedal and weigh less enough to carry. People are more health conscious today, due to the alarming rise in American obesity. 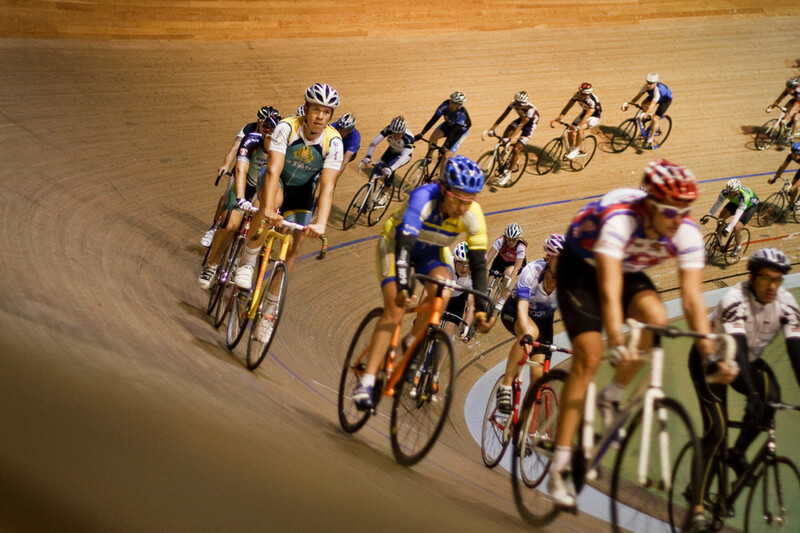 Bicycle riding is an easy way to shed some pounds and get back into shape again. They are also great for cruising through beautiful bike paths in a neighborhood park. Those of us that are thinking green will be happy to get around on a non polluting machine. College students may also consider an economical way to get around. There’s sure to be one to fit every budget. I have reviewed the some of the most economical and best rated cruising bicycles for women. The bikes change frequently and the inventory may not be available. 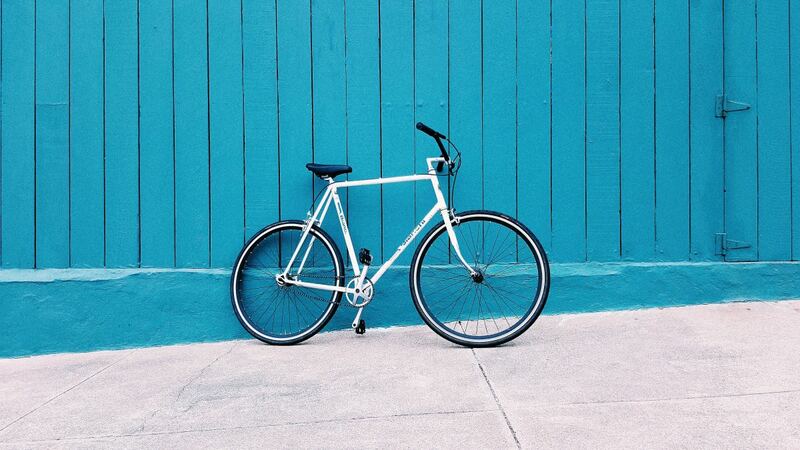 Check out the other cruiser bikes for the perfect fit. The first ladies riding bicycle to discuss is the Huffy Newport. Women’s 26 inch wheels. It has a steel cantilever frame, chain guard, pedal stop brakes, single speed, whitewall tires comes with a lifetime frame and 6 year components warranty. This is a classic, no-frills kind of bike, from a company that began in 1892. They may go on sale in the spring so find one before the big summer demand . 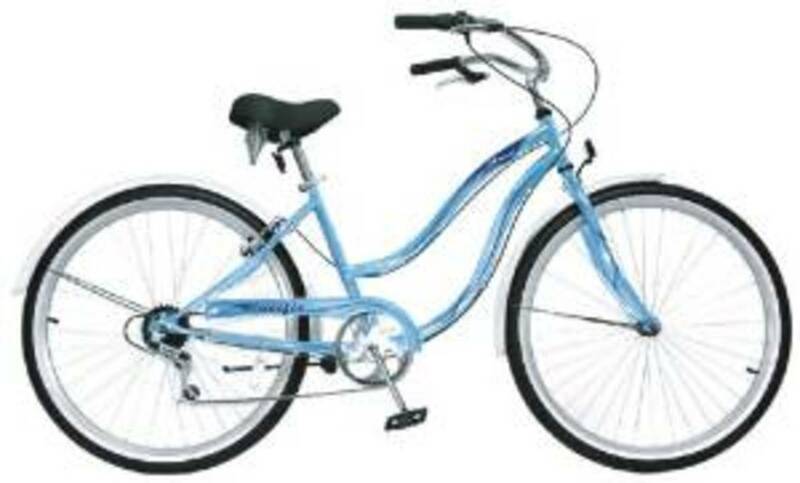 The next ladies bicycle is the ladies Schwinn 26” Roxie Cruiser. Schwinn is another company that is had a good history and has been around since 1895. This is made with a steel cruiser frame and steel springer fork. and Shimano 7-speed rear derailleur with SRAM grip shift. The alloy rims are rustproof with stainless steel spokes on whitewall tires. Also nice to have is a very cushioned seat and alloy linear pull brakes. You don’t have to step on the pedal to stop. 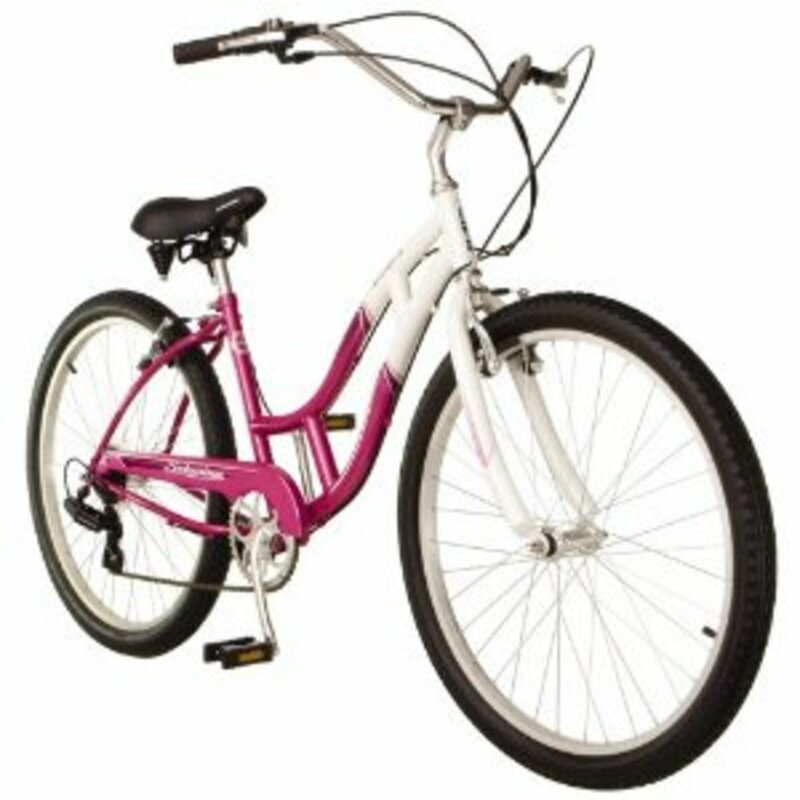 The pink frame color with black fenders and handle grips are definitely for the ladies. 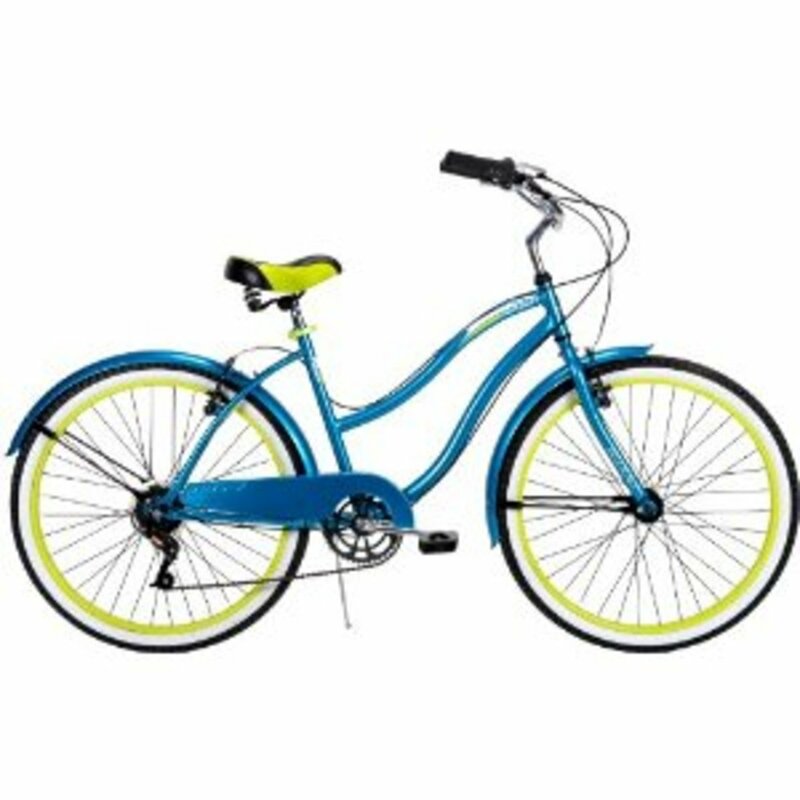 The third women’s bicycle I’ll discuss is the Schwinn Southport Cruiser with 26 inch wheels.This has a steel frame, cruiser handle bars rigid fork, 7 speed SCHRAM speed shifters and front and rear alloy brakes. This model is pink and white with black seat and handle grips. It does not come with fenders and weighs 26 pounds with a 5 year warranty. You can also choose a silver and red frame color. 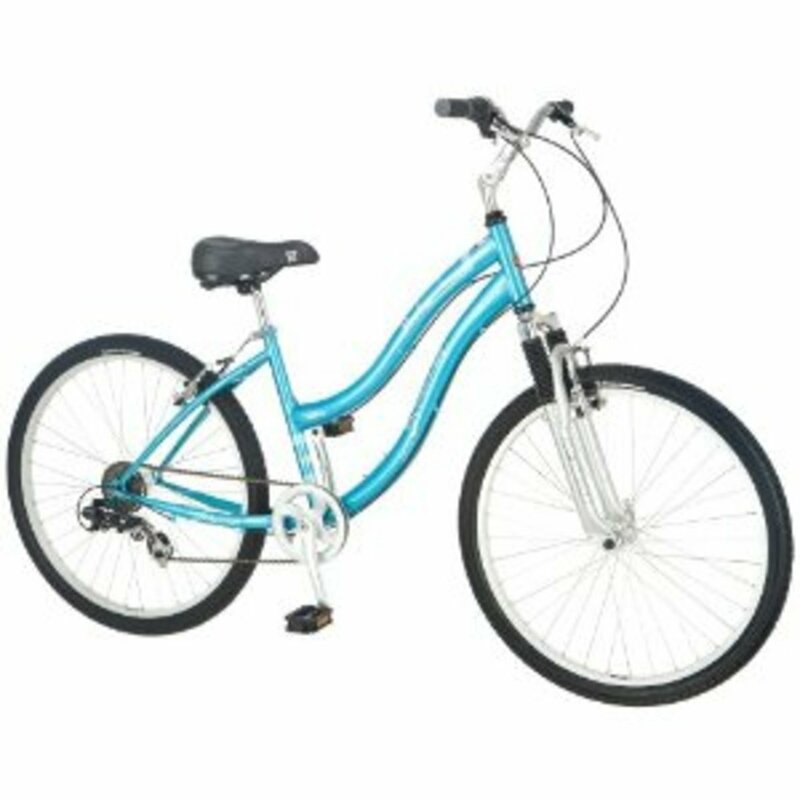 Another good choice for women’s cruisers is the Pacific Shorewood women’s cruiser bike with 26 inch wheels. It has 7 speeds, easy reach handlebars and a nice cushioned seat. A classic look painted with light blue frame, whitewall tires, and full wrap front and rear fenders. You have your brakes on the handle grips. A very good looking bike for the money. This next bicycle I have tried out myself and it is very comfortable and easy to ride. A comfortable 7 speed leisure cruiser bicycle for the ladies made by Firmstrong; model urban lady. It does have hand brakes so you don't have to try stopping by standing on the pedals. As any woman can attest to this, the extra wide cushy seat will help on those long rides. The 26 inch wheels glide along paved roadways as well as the beach. 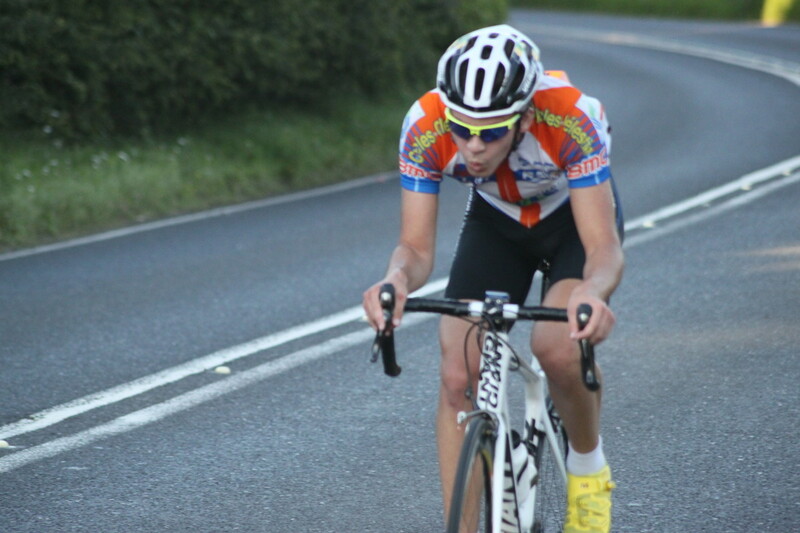 Upright handle bars are easy on the back. The baby blue color is appealing along with the mint green. Optional color matched fenders, basket and other accessories complete your individual look. I like having a basket myself. It may look funny to some serious bikers to have one but they do some in handy. And I would also add the optional fenders as well. 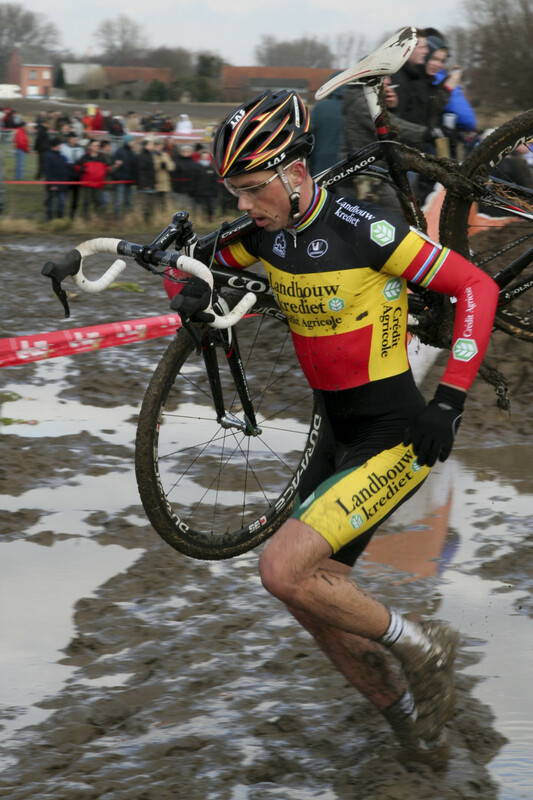 I always have some dirt or sand on my shoes and pants whenever i finish a long ride. Sometimes dirt can blow into my face on blustery days,causing a slight safety issue. besides, those shiny chrome fenders add a little class to your ride. I have checked out a few of these comfortable cruiser bikes myself and I would pick any one of these. Biking in the parks is one of my favorite activities. 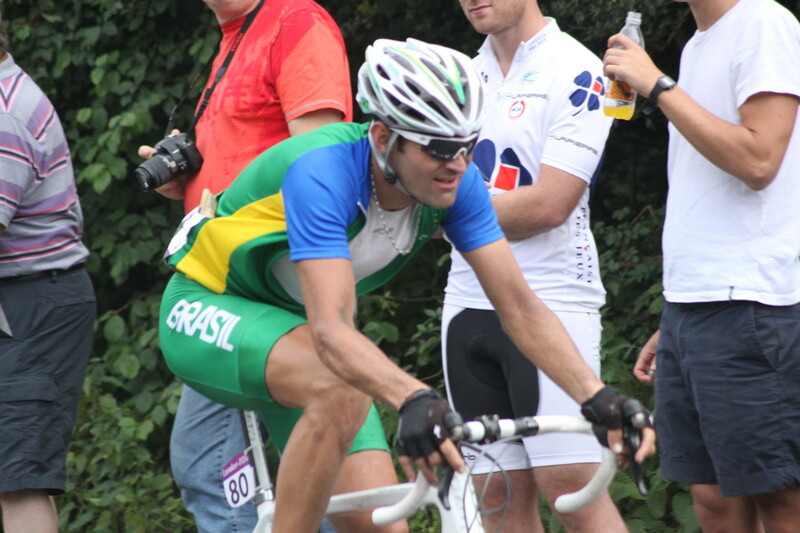 The riding or cruising bicycle is a popular way to get fresh air, exercise and cheap transportation. It is also a "green" product as it doesn't add to the air pollution problem. Consider any accessories for your bike such as a basket, adding fenders, a bigger seat, a helmet pro-cam or a bike lock. So there are a few of the more economically, priced women’s cruiser riding bikes with good customer ratings. The bikes reviewed here are so popular that they routinely run out of stock so shop early in the season. You can certainly buy a more expensive brand but if you want to save some money and the environment, as well as get into shape, then why not consider some of these? @Phyllis Doyle; A cruising bike is easier to ride,especially for older folks and those who may have back problems since you can sit up when riding it and not hunch over. Hi Stacie. I have been seriously thinking about getting a bike and this hub on cruisers is very helpful - so glad I came across it. Thanks for the information. I'll take any women's bike with a nice cushy seat. And I want all the bells and whistles: a basket, a bell, a kickstand, the tire guards, reflectors on the pedal and spokes...Thanks for the hub, you have inspired me to get a bike and to know what to look for. Silk Thimble: thanks for stopping by and commenting on my women's cruiser bikes review. Thanks for the suggestions. You provided a really nice range of options.